Windows NT 3.5x is a family of NT-based operating systems released by Microsoft. These versions of Windows are the last of the NT series with the Windows 3.1-style user interface, as Windows NT 4.0 would introduce the Windows 95-style shell. These versions succeeded Windows NT 3.1. Notably, an early version of the Windows 95-style shell is available for Windows NT 3.51 via the NewShell update. NewShell replaces Program Manager and adds a new desktop, taskbar, and user interface graphics. Windows NT 3.5 was released on 1994-09-21. 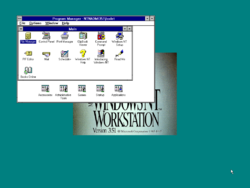 It is the first version to feature the edition names of 'Workstation' (previously called simply "Windows NT") and 'Server' (previously called "Advanced Server"). It cannot be installed on a computer with a processor newer than the original Pentium without modifying setup files. Windows NT 3.51 is the first release of Windows NT with support for the PowerPC architecture. It also introduced PCMCIA support, NTFS file compression, replaceable GINA, 3D acceleration in OpenGL, Windows 95-styled common controls, as well as new versions of Sound recorder, Media player and Windows Help applications. This page was last edited on 4 March 2019, at 10:39.